Social networks users were also consulted about the cover and back cover images. Rubberband decided to bypass the international signaling systems for trails and designed a nice icon system to represent the routes types. 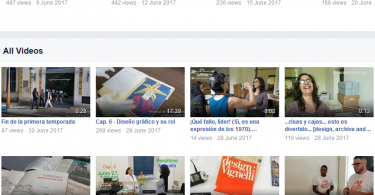 In addition, as part of the Design Thinking methodology, tests were done with users during the routes and, according to their comments and reactions, the relevant adjustments were made. 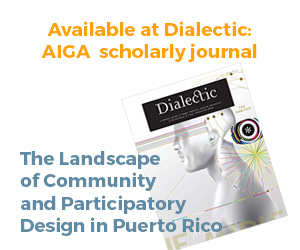 Foreword was written by international artist Ernesto Pujol. The visual communication strategy sought to bring hiking closer to people and prevent it to look like a technical practice. For each one, a map of the route was presented, to which technical heaviness was smooth out by using the icons and other graphic elements. To encourage hiking in a country that has no culture of walking, where leisure spaces are little known, and where people move by car for almost everything. That was the challenge presented to Rubberband, because of its well-known philosophy of socially responsible design. 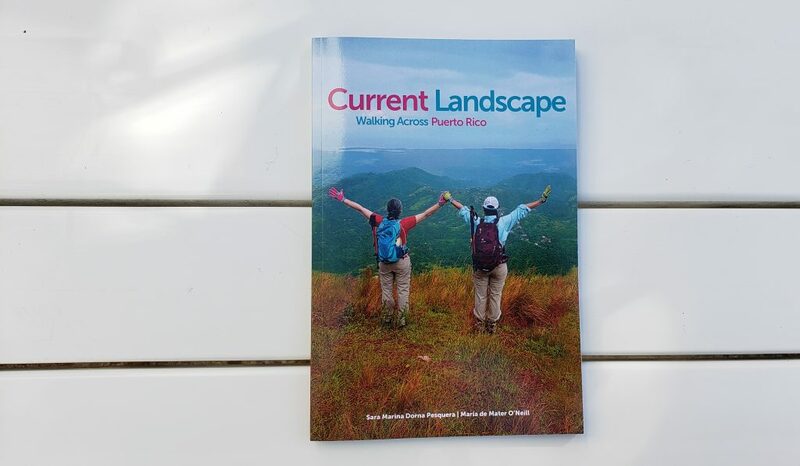 Motivated by the difficulty they faced of identifying places to practice their hobby, the authors, hiking enthusiasts (one of them Rubberband’s creative director), wanted to share their walking experiences through forests, walks and natural areas of Puerto Rico. 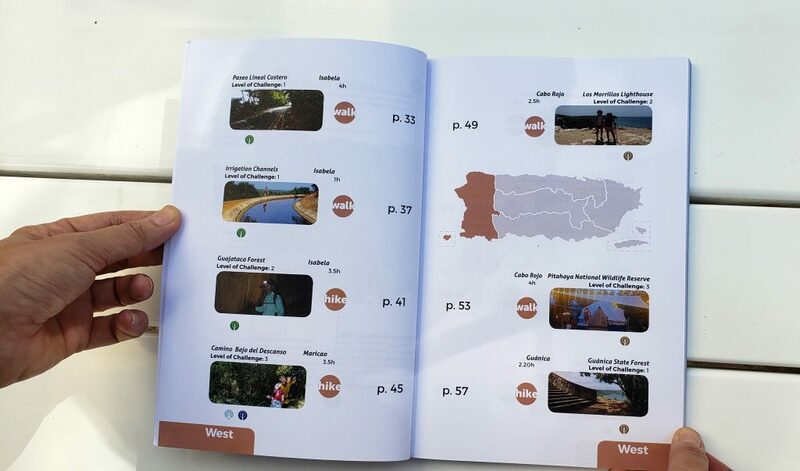 With the strategic idea of promoting Nature Tourism in our country to contribute to its economy, the proposal was a book that does not have the rigidity of a guide; but still must encourage hiking in Puerto Rico. Using a user-centric probe, Rubberband consulted if it was preferable to make a printed book or a digital one. 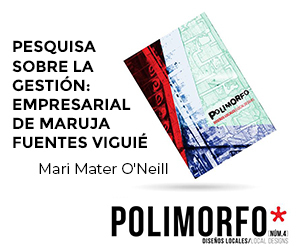 The survey participants expressed predilection for a printed book because it is more convenient to consult. Therefore, it was decided to print a small size and light book. Social networks users were also consulted about the cover and back cover images. In addition, as part of the Design Thinking methodology, tests were done with users during the routes and, according to their comments and reactions, the relevant adjustments were made. 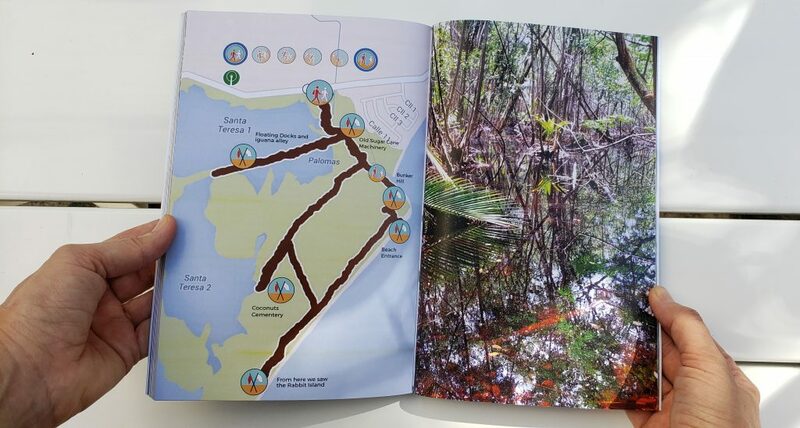 The comprehensive design strategy combined storytelling techniques with practical and visually attractive information of at least 27 places that the authors documented in their walks on the island. To prevent the book from becoming a personal photo album, care was taken in the selection of images, emphasizing mostly on the landscape. In addition to stimulate the reader to have their own experiences, love for the island was also encouraged. 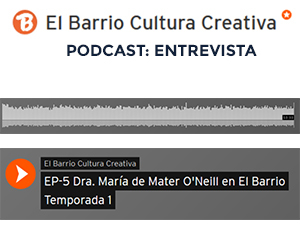 Likewise, the stories, presented in the form of chronicles, seek to excite the reader, while it is educated in an enjoyable way about the treasures we have in our country. The visual communication strategy sought to bring hiking closer to people and prevent it to look like a technical practice. Since it is not a guide, Rubberband decided to bypass the international signaling systems for trails and designed a nice icon system to represent the routes types. These in turn were organized by type of walk (walk, hike or trek), and by geographic regions and towns. For each one, a map of the route was presented, to which technical heaviness was smooth out by using the icons and other graphic elements. Also, with a scale of 1 to 10, the level of difficulty of each route was indicated, stating the provision that the given level corresponded to the physical condition in which the authors felt at the moment of making them. 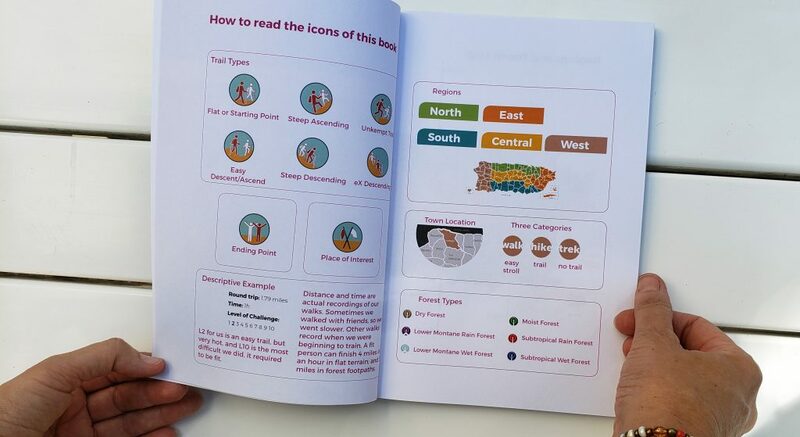 Since it is not a guide, throughout the book the reader is reminded of his responsibility to verify the information, do his own data search, and prepare adequately for the walks. 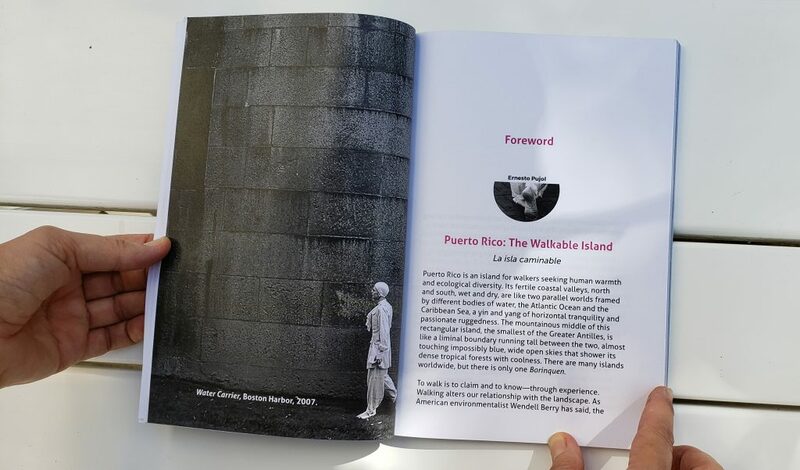 The book, entitled Current Landscape: Walking Across Puerto Rico, has been welcomed with joy and even gratitude, for it is perceived not as a mere book, but as a palpable portrait of the possibilities of the country. 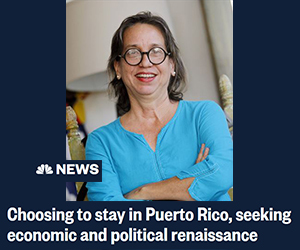 Several inns, hostels and glamping sites in Puerto Rico have acquired it and showed it to guests and visitors who like nature tourism. Also, the book was presented in an activity of recreational therapists. 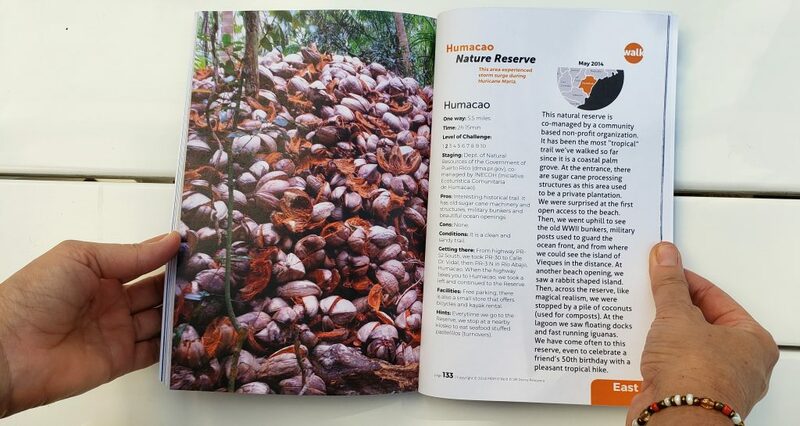 At the moment, in addition to Amazon, Current Landscape is available at the specialized camping store Acampa, the gifts shop The Smart Shop and in different Para La Naturaleza reserves.